Tomorrow night, the city is holding a pivotal meeting on the future of property adjacent to Discovery Park in Magnolia: will the possibility of much-needed affordable housing at the former home of Fort Lawton finally be realized? Or will concerns around impacts to the neighborhood cause the site to become merely more park space in a neighborhood that doesn’t really have a park space deficit? As Doug Trumm reported last June, the future of the last developable site at the federal site of Fort Lawton, an army base dating to 1890, has been in question since 2005. A decade ago the city tried to pursue housing on the site and was stymied by a lawsuit brought by neighborhood residents–the Great Recession put the plans on ice until now. The city is currently proposing that all of the housing built on the site be affordable housing for various income levels. A total of 238 units are proposed, including 85 units for formerly homeless seniors, 100 affordable apartments, and 52 affordable homeownership opportunities in the form of rowhouses and townhouses. The Draft Environmental Impact Statement (DEIS), the latest hurdle that the development is set to clear before becoming a reality, was released by the Office of Housing last month. The alternatives studied in it included only building market-rate housing on the Fort Lawton site and building affordable housing at an alternate site in Laurelhurst, and also turning the entire Fort Lawton site into only additional park space. But the park space-only proposal would only include 10 acres more than is proposed in the full affordable housing proposal. She notes that our current homelessness emergency requires a massive investment in housing for both those experiencing homelessness now or those at risk of becoming homeless due to economic displacement. While the addition of an additional 12 acres (on top of what’s proposed in this development plan) to Discovery Park’s current expanse of 534 clearly doesn’t pose a compelling alternative to the ability to take a small step toward alleviating our homelessness crisis, ultimately it may be up to the hearing examiner to determine if the city dotted its i’s and crossed its t’s. However, public support for the project from all over the city will go a long way toward furthering the goals of the Office of Housing with this proposal. With the appeal of every EIS from citywide Mandatory Affordable Housing (MHA) to the city’s backyard cottage proposal, appeal of this EIS seems all but a certainty. Whether the time has finally come for Fort Lawton could be determined this year; the Office of Housing plans to submit a full redevelopment plan to the city council this summer for approval. Comments on the DEIS can be emailed to OH_comments@seattle.gov and must be submitted on or before January 29th. The public open house tomorrow night (Tuesday, January 9th) will be at 6pm at 3555 W McGraw St, Seattle. If you pick this event over our monthly meet up at the same time, we completely cheer you on. I’d like to point out to the commenters lamenting lack of transit access to Fort Lawton- until recently, with an investment in service from Prop 1, the route 50 had approximately the same number of runs as the 33, which runs directly to Fort Lawton. 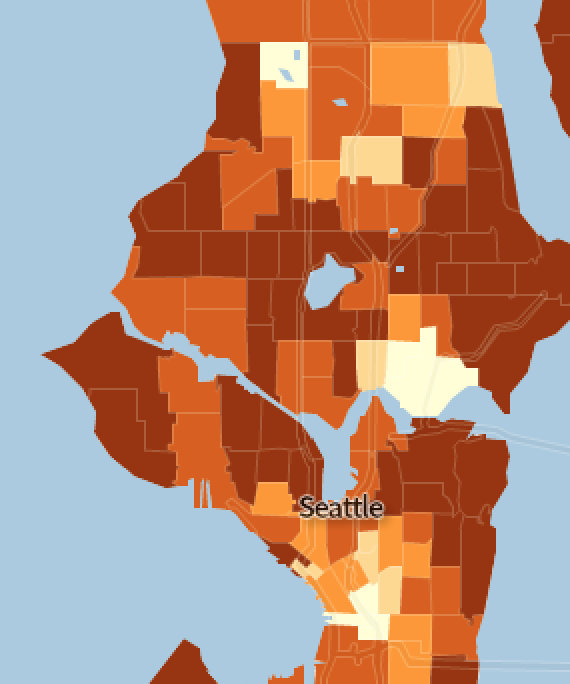 Seward Park is definitely somewhere that most would support affordable housing development. Not sure I fully understand your point since I know nothing about route 50. In any case, if this project included a proper infrastructure investment so that lower income residents could actually live there w/o owning a car then I’m completely on board. Again, my point is that we have plenty of areas that wouldn’t require any infrastructure investments, would not pave over the limited amount of park space available in the city and could probably support a lot more housing. Heck, look at the millionth storage unit under construction right now on 15th by the Magnolia bridge near a rapid ride stop. Why aren’t we building housing there instead? Because this, as a former federal facility, can be given over to the city at minimum cost. My point was that the transit service is pretty decent, bound to get better once demand picks up with projects like this in Magnolia. I’d also like to point out that traditionally lower income housing is usually sited next to high volume arterials like you mentioned, with generally worse health outcomes compared to wealthier areas. There is a direct bus between two of the neighborhoods you mentioned and Magnolia, which is more than i can say for a lot of neighborhoods. But if Magnolia wants great bus service like Wallingford or the U District, they’ll need to add residents. I happen to know a great place to start doing that. My wife and I take the 31 to work, which goes to Wallingford and the U-district. It goes nowhere near the park, does not come on Sundays, and stops service after 630-7 during the week. It takes my wife 90 minutes coming back from the Udistrict during rush hour evenings. This is not good transit. You are correct about Magnolia needing more people to get better service, but it sounds like the city is “compromising” by building less housing at this site making this project even more worthless. Seems like a better compromise would be building market rate apartments but a lot more of them than what is in the affordable housing plan. I rely on the 31/32 to get to campus as well; that sounds like a tough slog. But I think it’s important to remember this is a long-term investment. Seattle has been passing progressively larger levies to improve bus service. The 33 and 31 will likely only get more frequent, and Metro 2017 report identified 33 as a route to add additional trips. Looking out even longer, by the time Interbay gets its two Link stations at Dravus and Smith Cove, I expect Metro to have greatly boosted bus service in Magnolia (and do some restructuring) to feed the stations. I honestly didn’t think it was possible for the city to pick a location to build affordable housing that I would be against but they’ve managed to succeed. I am as disgusted as the next person with the NIMBY’s quoted in the Stranger that are against this project, but I also don’t support a project just out of spite. Why does the city insist on building in an area with intermittent public transit access? We have so much vacant and underutilized land along industrial zoned areas along 15th and Aurora that have rapid ride bus lines and services within walking distance. This just feels like a lazy symbolic gesture for the city to pretend it cares about building affordable housing. It’s rare to build an affordable housing project where the land cost is zero. Fort Lawton gives us that opportunity. I agree it’s unfortunate that the city scaled back the project to try and appease the neighbors, instead of going big and providing high quality transit to the whole neighborhood. The land cost may be zero, but what is the opportunity cost? Opportunity cost (the only cost that really matters) is what you could have done instead with the land, or with the city’s limited funds for affordable housing. Affordable housing should be an opportunity to create mixed income neighborhoods through transit oriented development. This project seems more like an isolated ghetto. The proposal is a mixed income development, where the percentage of affordable units is the percentage of the land that is free. When Ballard light rail comes online, Magnolia buses will provide a reliable connection to downtown. Until then, perhaps the city could convince Magnolians to relent if high quality transit was provided to the whole neighborhood. Addressing opportunity cost, more park land doesn’t make sense next to the massive Discovery Park, and the city can leverage its affordable housing dollars pretty far if it doesn’t have to pay for the land. In fact the opportunity cost of not taking this deal is immense. If anything, I wish the city didn’t back down from the original proposal and went big on a mixed income development providing poverty services, coupled with expanded bus service for the development and neighborhood as a whole. This city doesn’t go big on anything unless big money is behind it. Opportunity cost is reflected in the constraint that the city doesn’t have the resources for many such projects. Doing this one means not being able to do another one somewhere else. The voters have already passed an affordable housing levy, and every politician knows there is no going back to the voters for more. This seems like stretching the concept of opportunity cost pretty far. What available sites are so vastly superior to Fort Lawton that they’d override what is essentially a 20% discount given the free land? I’m not sure why you think Fort Lawton wouldn’t lead to a mixed-income community. The redevelopment would have families at various level of income, balancing out the extreme wealth of Magnolia elsewhere. Any addition to Magnolia, which has scarcely seen a SOH project in four decades would be an improvement. Your use of “ghetto” doesn’t square with the fact Fort Lawton residents would get to go to a great school district and have amazing park access. These aren’t typically traits of slums. And as to transit access, the Route 33 is really a pretty solid bus and is slated to get additional hours. In seven years time when the Fort Lawton site is fully built out, I bet it will be in much better shape. In other words, this is TOD. Seattle is a great school district? Get real. They ship off high school students across the city and some middle school students over to QA. extreme wealth of Magnolia? Not sure what you are talking about. 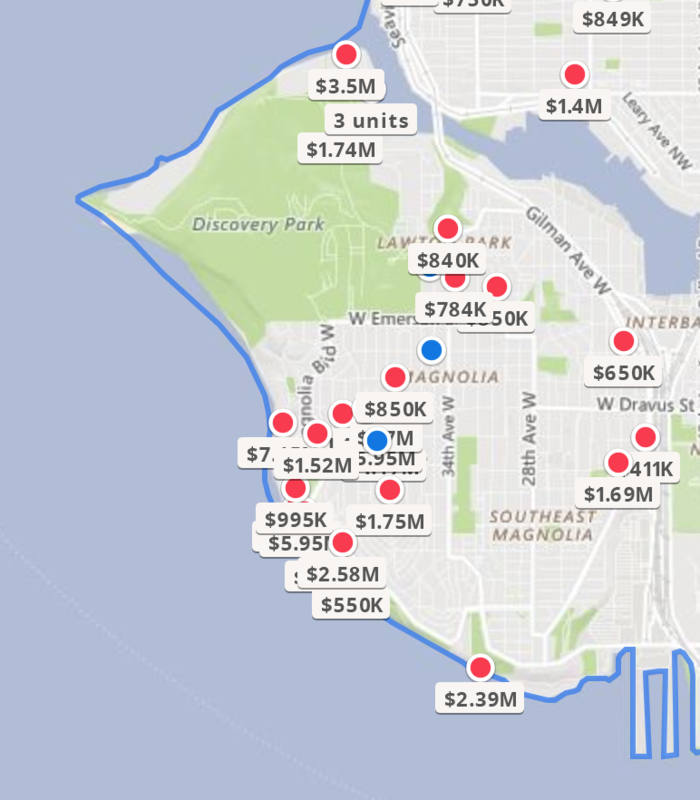 All sorts of income levels in Magnolia currently. Get out there, get to know the residents, far from extreme wealth. Transit in Magnolia is scarce, overlooked by Metro and Sound Transit. Take away the Federal Land discount, this is not a site for a low income housing development. This is not a Magnolia issue but a Fort Lawton issue. From the US Census Explorer (https://www.census.gov/censusexplorer/censusexplorer.html ). Darker is richer, darkest is a household income above $75k. From Zillow (https://www.zillow.com/homes/for_sale/Seattle-WA ). Lots of millions over there. That’s exactly what opportunity cost is! Go re-read your economics textbook. The City of Seattle has the ability to create value by upzoning land. There are many potential sites near Northgate, or even better, near existing ST2 portions of light rail, which would be better uses for the city’s limited affordable housing funds. Build affordable housing now that strengthens market rate housing and existing businesses nearby. I share your distaste for the Magnolia opponents of the Fort Lawton project, but why should urbanists antagonize them? This shouldn’t be about imposing upon Magnolia its quota of affordable housing. Magnolia is a suburban development in all but name. It lacks the services and infrastructure for this project. Build near me in Capitol Hill and I will support you. While we appreciate your economics lectures, what I’m saying here is point to a project that can’t be done because we’re doing Fort Lawton and how such a project makes up for the free land in the Fort Lawton case. You point to Capitol Hill, where land is very expensive even for Seattle and acquiring it would be a big burden for a project there. Magnolia is on the suburban end of the spectrum for sure, but it is less than six miles from the CBD and has old streetcar bones, which gives much more potential that more recently developed suburbs. Maybe some spot in Interbay, close to Metro Buses, stores, services, future light rail….. The City cannot do that. The land is only free from the federal government if it is used for affordable housing. In fact the proposed development is mixed income, so only the land for affordable housing is going to be free (percentage of free land equal to the that of affordable units). Well, that’s a pity, as it really limits creative leveraging. My inclination would then be to gear the development to the upper economic strata of qualifiers for affordable, i.e., those who can afford cars, and put senior housing and housing for the formerly homeless in a more advantageous spot.